This is such a pretty piece. 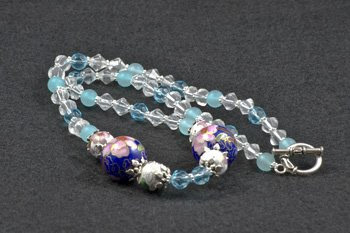 Twenty four long inches of light blue and clear beads, sprinkled with lots of silver, and a toggle clasp. Definitely one of the artist's favorites!! Please e-mail or phone if you are interested in any piece from this website or to order custom made jewelry. Please feel free to contact me with any questions or thoughts. or as a gift for someone else? expertise of a working jewelry artist? bracelets, all very reasonably priced. of pieces from which I could choose. necklace I had purchased elsewhere!